Motivated by the idea of turning Flushing Meadows, literally a land of refuse, into his greatest public park, Robert Moses—New York’s “master builder”—brought the World’s Fair to the Big Apple for 1964 and ’65. Though considered a financial failure, the 1964/65 World’s Fair was a sixties flash point in areas from politics to pop culture, technology to urban planning, and civil rights to violent crime. In an epic narrative, Tomorrow-Land shows the astonishing pivots taken by New York City, America, and the world during the fair. It fetched Disney’s empire from California and Michelangelo’s La Pietà from Europe and displayed flickers of innovation from Ford, GM, and NASA—from undersea and outer-space colonies to personal computers. It housed the controversial work of Warhol (until Governor Rockefeller had it removed) and lured Ken Kesey and the Merry Pranksters. Meanwhile, the fair—and its house band, Guy Lombardo and his Royal Canadians—sat in the musical shadows of the Beatles and Bob Dylan, who changed rock and roll right there in Queens. And as southern civil rights efforts turned deadly, and violent protests also occurred in and around the fair, Harlem-based Malcolm X predicted a frightening future of inner-city racial conflict. World’s Fairs have always been collisions of eras, cultures, nations, technologies, ideas, and art. 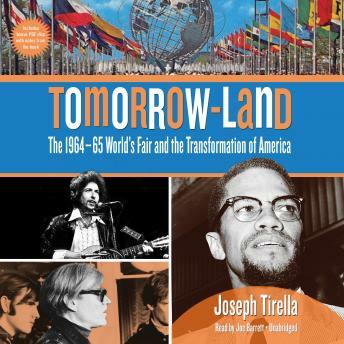 But the trippy, turbulent, Technicolor, Disney, corporate, and often misguided 1964/65 fair was truly exceptional.